For more of CBS News' Jan Crawford's exclusive interview with Education Secretary Betsy DeVos, watch CBSN, "CBS Evening News," and "CBS This Morning"
Education Secretary Betsy DeVos intends to revoke former President Obama's 2011 guidelines for schools investigating campus sexual misconduct, she told CBS News' Jan Crawford in an exclusive interview Thursday. 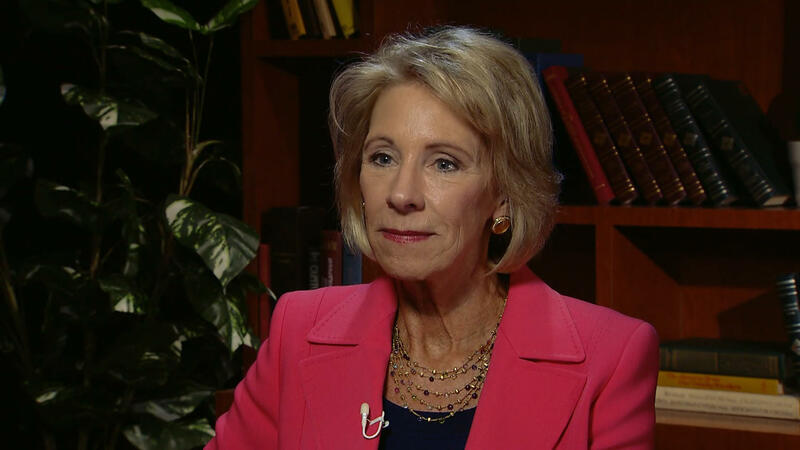 Noting that DeVos, in a speech just before the interview, had announced the Trump administration would revise the current policy but did not say that she planned to rescind the 2011 directive, Crawford asked the Education secretary, "Are you today rescinding the Obama administration guidelines?" "Well, that's the intention, and we've begun the process to do so," DeVos responded. "And as I've said earlier, in all of this discussion, it really is a process not an event." She reiterated, "But it is the intention to move beyond that and move towards a better way." "The process is an extended one," DeVos added, "But it is the intention to revoke or rescind the previous guidance around this." In 2011, responding to alarming rates of campus sexual violence, the Obama administration issued a "Dear Colleague" letter with guidelines for investigating and adjudicating sexual assault on more than 7,000 universities that get federal funding. The guidelines lowered the standard of proof in sexual assault cases and allowed accusers to appeal not-guilty findings. Federal funds would be withheld from schools that didn't comply. But opponents, including leading law professors and civil libertarians, argue the guidelines disregard due process and have created another class of victims: innocent students who are accused of sexual assault, denied fair hearings and wrongly punished with suspension or expulsion. DeVos said her department will develop guidelines that continue to protect sexual assault victims, while also ensuring fair hearings for the accused. It will take time to undo the previous guidelines, DeVos suggested. "The process is an extended one but it is the intention to revoke or rescind the previous guidance around this," she told Crawford. Earlier on Thursday, while delivering remarks at George Mason University, DeVos announced the administration would be taking steps to revise the current policy, by seeking "public feedback and combine institutional knowledge, professional expertise and the experiences of students to replace the current approach with a workable, effective and fair system." The Education Department, DeVos said in her address, would be launching a "notice-and-comment process" to re-vamp the Obama-era policy on addressing sexual misconduct, incorporating the "insights of all parties in developing a better way." While she condemned acts of sexual misconduct as "reprehensible, disgusting and unacceptable, they are acts of cowardice and personal weakness" DeVos criticized the investigative process of of Title IX investigations and cases. "Any perceived offense can be turned into a full blown Title IX investigation. If everything is harassment then nothing is," said DeVos, a critique that suggested that the Obama administration had gone too far in writing its 2011 directive.